Hey, I have gotten the game files and I'm trying to look up to extract their models. 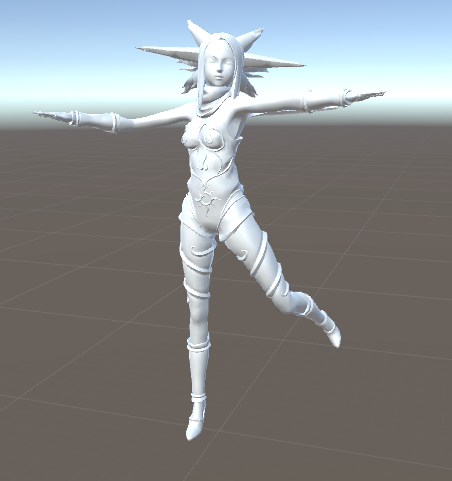 Hope this isn't too big of a necrobump, but the model files are in the gfx folder. I'm using Model Researcher to figure things out, and verts extract directly from the hex data. The models are in ZYX format, but there's a good number of wild vertices coming up. 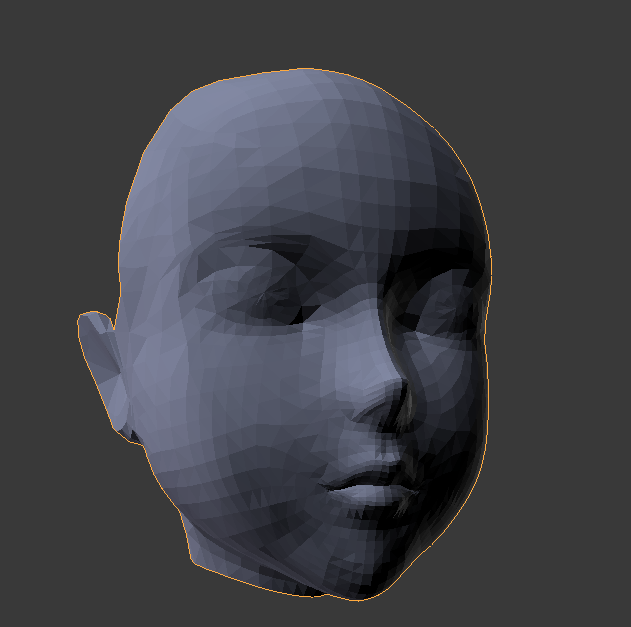 I think the face and UV data is intermingled with the vertices. They both seem to have a flat version of the main model, probably for shadows. Finding the verts was easy enough, but it might be interesting figuring out how to get the faces and UV's working. And thanks for the insight on the textures. I was hoping it was something someone's seen before. The data you are reading is collection of vertex blocks. I am not familiar with Model Researcher, but you probably need to use the padding option. I will give you an example with hex2obj. Vertex blocks are 32 bytes each. Like you said they are easy to see in the hex editor. 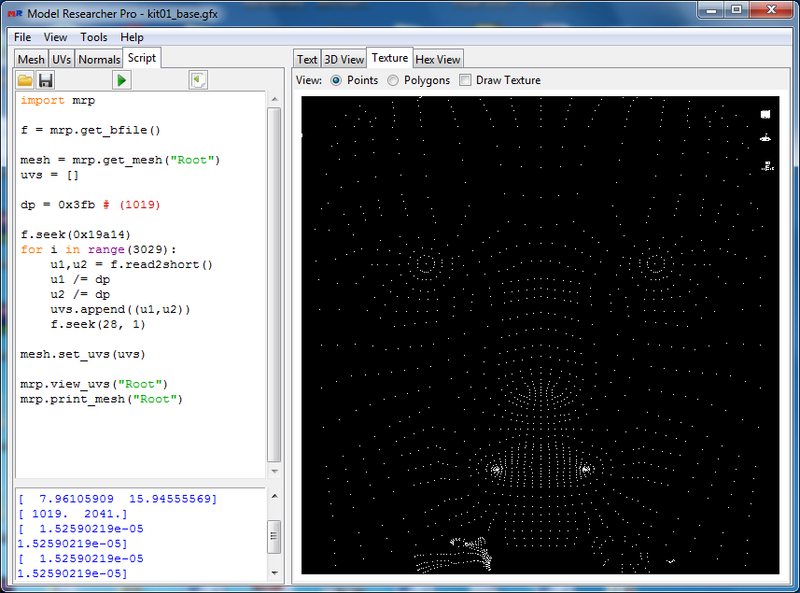 For the first submesh after the end of the vertex blocks there are some 0s and then the face indices start. For another mesh I have seen that it starts right after the blocks end, with no 0s between. Still it seems to be right under the vertices. Shouldn't be hard to find. UVs should probably be somewhere inside the vertex block, but I haven't checked that. Ok, sweet! That got me a lot further. Indeed, a padding of 20 gives me the verts I want, and I'm able to get faces, too. 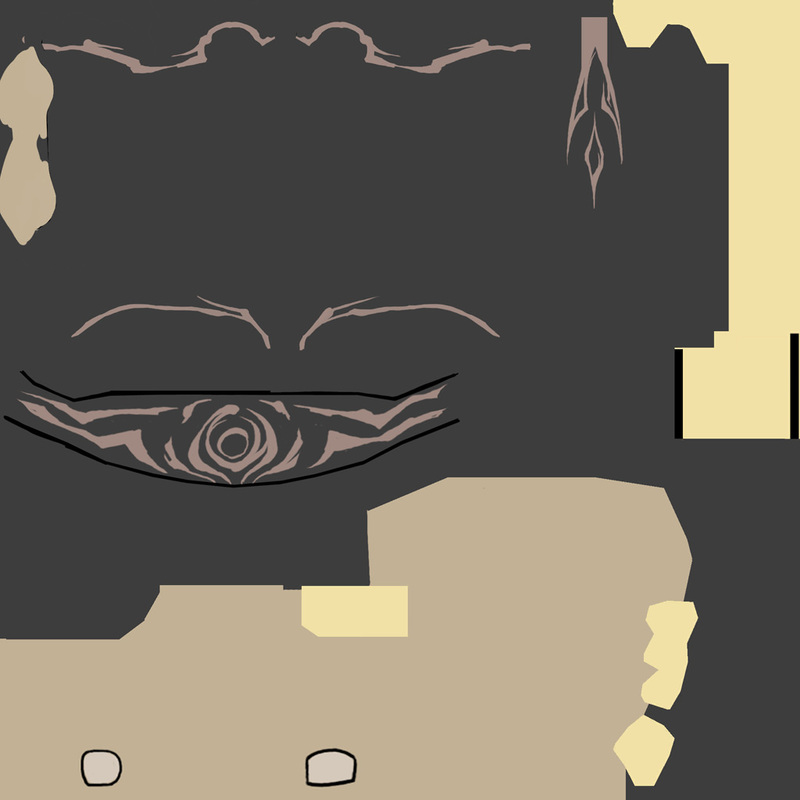 But I'm getting a bunch more faces than I want on ModelResearcher, and they're inverted. I'm using shorts, which seems to be the right size, but so far I'm thinking I need to cut down the count to get rid of the junk. Got a smooth looking mesh with a count of 4509. Hard to notice the shift in numbers. Roflcopter wrote: Got a smooth looking mesh with a count of 4509. Hard to notice the shift in numbers. Also I looked at the files of Gravity Rush (first game) and they don't look very complex. I was able to get the skeleton and the weights too. It just has some slight problems with the weights. 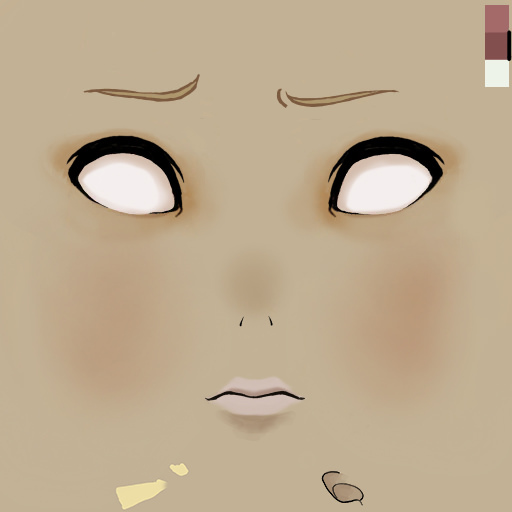 I will think of making a tool for exporting Gravity Rush models in the future. Maybe also for the second game, there seems to be just a couple of differences regarding the model data. Awesome. I don't have the first game's files yet, so I can't see the differences. Do you have some hex examples? 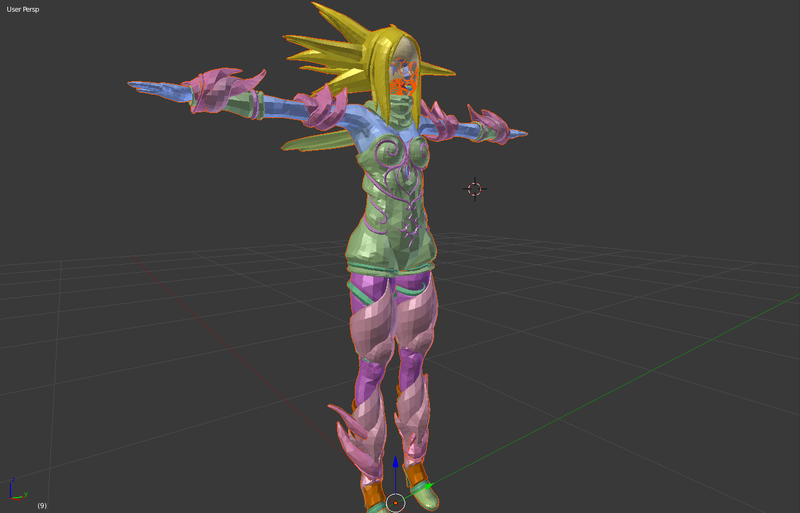 I will think of making a tool for exporting Gravity Rush models in the future. Maybe also for the second game, there seems to be just a couple of differences regarding the model data. I'd be looking forward to that. It definitely beats getting one mesh at a time. EDIT: Shifter 2.0 progress. Even got the faces worked out (had to flip the Z-axis, haha)! Speaking of faces, she has a whopping 40 expressions. I guess instead of rigging her face, they decided to make a new mesh for each of her expressions. Now it's on to the UV's. They've been a pain to figure out so far, but I'm sure I'll get it pretty soon. Aside from the vertex and face data, there are two more alternating patterns near the end of the file. I haven't had any luck finding UV's alongside the vertex data, so maybe it's somewhere in there. Or I'm just not reading the vertex data correctly. I guess multiplying the V coordinate by 2 should do the trick. I'd love to know why it's like this, though. akderebur, have you been getting UV's like this? As for the textures, the purist in me wants to know if there's a layered format we can export to, but I guess I'll just export to bmp. It's lossless and I haven't had trouble with it so far. Roflcopter wrote: akderebur, have you been getting UV's like this? I remembered that I actually didn't get the uvs for gr2, I got them for gr1. They were in the vertex block as half floats if I remember correctly. Also some of them were outside the 0.0 - 1.0 range but it is not a problem. Looking at your image I see that it is a different result than what I have in gr1. I will take a look at the files when I have the time. When texture coordinates are stored in Short, they need to be divided by a number in order to translate these coordinates into floating-point numbers. In the Model Researcher, this number is 0xffff. In this case, the calculated values are converted to texture sizes. To avoid this, you can use the script. I see from the screenshots that a Pro version. Change the value of dp to correctly apply the coordinates to the texture. 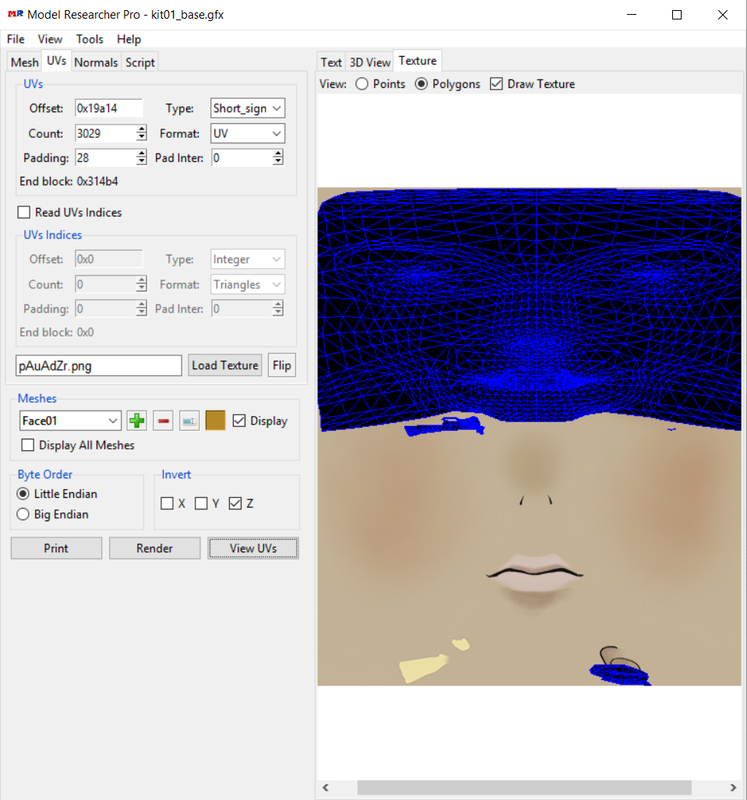 The texture can be loaded in the UVs tab so that it is also displayed when the script is run. Ah, ok! So the magic number for dp was of course 1024. And the script works nicely with the other textures. Thanks for the help, you guys! That just leaves the skeleton/armature, as far as I can tell. But I can make an obj of Shifter 2.0 now. Roflcopter wrote: That just leaves the skeleton/armature, as far as I can tell. This is the reason I haven't released my program actually. It can read the meshes fine, the skeleton and the weights too but that doesn't mean much if the bone indices are wrong. Btw are there any other files that might be related to skeleton in gr2? I have checked "kit01_base.evd", it has some text that looks like bone names, but other data doesn't look very useful. I am wondering if there are other files with the extension ".skel", like in gr1. Yeah, in the eaf folder, I found a bunch of .mot files that look like actions, just judging from their names. There are more evd files in the lua->chardefs->player folder. I see kit01.evd there. Roflcopter wrote: There are more evd files in the lua->chardefs->player folder. I see kit01.evd there. If they are inside the lua folder they are probably not what we are looking for. If you find anything with the extension ".skel" or any other file that you think might be related to skeleton data, please post it here. I don't have the gr2 files. Here are kat's .mot files; still haven't had a good chance to look at these myself. Thus far, all of the .evd files I've found were in the lua folder. And there don't seem to be any .skel files at all. edit: after a quick glance, I'm seeing what look like vertex blocks in the files I sent. It looks like they packed the animation and skeleton data into a single file. Still it is the right file. I can see some quaternions and float values together, they are probably bone transformations. I will look into it later.